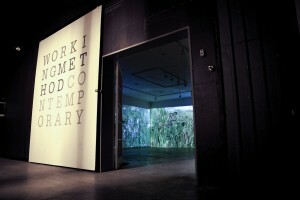 Exterior shot of Working Method Contemporary. Another successful First Friday was had this month at Working Method. This is the second collaboration by the League of Graduate Artist’s Summer Club with MFA grad artists: Marnie Bettridge, Chalet Comellas, Jay Corrales, Tyler Dearing, Dan Hall, Heidi Haire, Christina Poindexter, and Echo Railton. Visitors were invited inside the gallery to cast shadows for a series of ‘live tracings’. Three projectors illuminated the walls with footage collected by the artists on their adventures in the dank landscape that is North Florida. While moving images of clouds, forest pathways, and freshwater springs interchanged on the walls (along with their recorded sounds), visitors’ traces began to layer and interact giving beautiful results. Subject matter ranged from couples, dogs, and umbrellas. Visitors were able to leave their mark while the artists were able to to record directly on the gallery walls. Thank you to all that attended, we had a blast.